Doaa Al Zamel was a young woman living in Syria with her parents and siblings. It became too dangerous to stay in their home and the family fled to Egypt. They settled for a while, thinking they might just find some peace and happiness. Doaa fell in love with a man named Basseem and they started to think about marriage and starting their own family. Then the regime and climate in Egypt changed and they were harassed, assaulted, and unable to find work. Doaa and Basseem decided to make the perilous journey across the Mediterranean. Their journey does not go at all according to plan and Doaa, Basseem, and the rest of the people on the ship found themselves abandoned in the water. 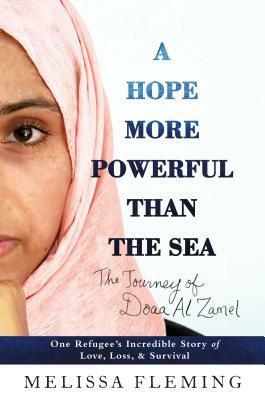 A Hope More Powerful than the Sea is the tale of Doaa's incredible survival. Author Melissa Fleming is the chief spokesperson for the UN High Commissioner for Refugees and she writes in the afterword of this book about her search for one particular story that would help the general public understand and empathize with the plight of refugees. When she read this one, she thought it was perfect fit. Doaa's story is indeed heartbreaking and compelling, but it feels very distant from the reader. I imagine some of that is due to Doaa and others working through a translator and then other reporters and colleagues contributing pieces to this book. I wish that we felt more like we interacted with Doaa, but her story is a vital one for everyone to understand just what refugees go through in their attempts to reach safety. Joanna Faber grew up in her mother's shadow. 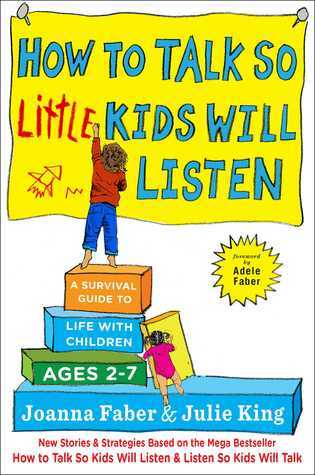 After all, her mom was one of the authors of How to Talk So Kids Will Listen and Listen So Kids Will Talk. When Joanna found she was still having trouble with her small children, she teamed up with her friend Julie King to write a guide that built on her mother's research but focused on toddlers and preschoolers. These moms draw on their own experiences, an understanding of psychology, and the stories of hundreds of parents to create a book that is indispensable for moms and dads. How to Talk So Little Kids Will Listen works as both a general guide and instructions for very specific circumstances. The authors provide parents with a set of ideas that they refer to as the parenting toolbox, like acknowledging feelings, making things fun, giving a choice, or problem-solving with your child. These tools are then shown in application at bedtime, when your child lies, and during the madness that is trying to get out the door in the morning. This is a book that I will be referring to often, as I navigate life with my little girl. I had wanted to read A Hope More Powerful than the Sea, but after reading the sample, I just wasn't very interested. Sounds like I may need to try again! Thanks for your post. Both reviews I would say very topical because we really need to understand both. How to Talk So Little Kids Will Listen is going on my TBR right now. I'm always on the lookout for parenting books with practical tips, and this sounds like it fits that description perfectly! I'm sorry to hear that you didn't feel more of a sense of connection with Flemmings book, because I think that's mainly what I'd be looking for in any biography. It's Monday and the crazy continues! It's Monday; thank goodness for Facetime!